This post is mainly to create awareness in India.Ever since my childhood in the month between October and November on no moon day a festival name as Diwali is celebrated. My mom make sweets and we used to pray the god .When it comes in the evening , our home is beautifully decorated with lights which are nade if clay!people burn crackers with lots of noise and smoke .I hate this way of celebrating with crackers because of the noise pollution and air pollution.Heavy damage is caused to human beings and even the nature. The smoke which is released in huge amount is not safe to breathe.I don’t know the reason why i don’t like to lit the crackers since my childhood. It’s waste of money too. My hatred feeling grown gradually because of the awareness of the pollution and noise caused by them. There are several chemicals used in crackers. Heavy smoke hangs low in the air on diwali night and remains for few days after that too. The levels of sulphur nitrates, magnesium, nitrogen dioxide are injurious to respiratory passages. Diwali can be potential fatal to asthmatics. Sulphur dioxide: Causes wheezing and shortness of breath. Cadmium: Can cause anemia and damage to kidney and also affect the nervous system. Nitrite: Can cause skin problems, eye irritation, and respiratory problems in children. Unfortunately,every year the quantum of air and noise caused due to the explosion of firecrackers increases on Diwali which causes ailments like bronchitis and asthma. This is a kind note to everyone to celebrate eco-friendly diwali from this year and save the nature from pollution. Diwali not only marks crackers , it’s family reunions,glittering lights and exchange of sweets and smiles😊. 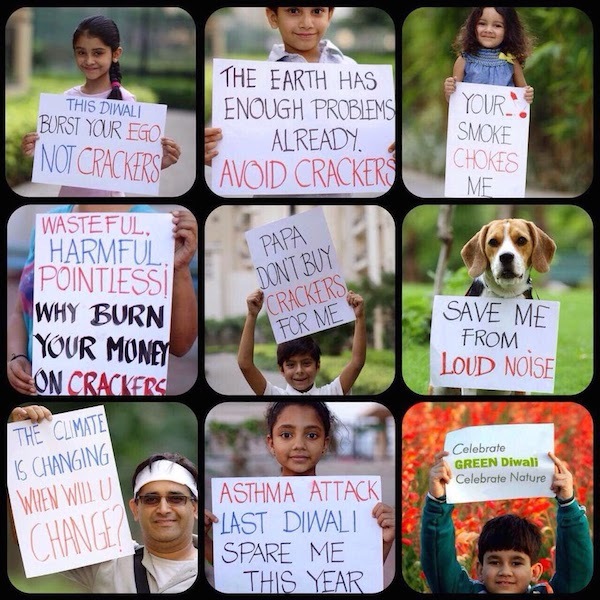 Do share this post on Facebook ,and Twitter to create awareness and SAY NO TO CRACKERS!! No need to describe the condition of capital of India, regardless of the causes of this condition. It has worsened, and has forced Delhites to stay in home as much as possible, and step out only with a mask.